A golden Labrador with a cupcake collar, with yummy treats dotted all around. 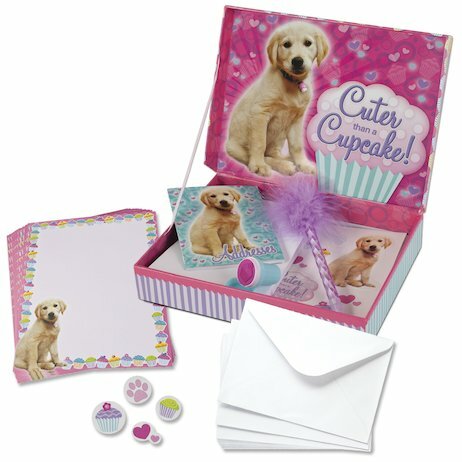 Seriously cute, oh-so-sweet writing kit to make your letters even more delicious! Honestly, we can’t decide what’s cuter – our fluffy friend with his adorable floppy ears, or the pretty cupcakes spangled all around him. Luckily YOU don’t have to choose, because this gorgeous set gives you heaps of both! So team up with this sweet-natured pup and gobble all these delicious goodies up! Kit contains 24 sheets of decorated writing paper, 24 envelopes, address book, sticker sheet, fluffy pen and cupcake stamper.